Challenge. Adventure. Teamwork. The C.O.P.E. Course at Currier. The best teams develop and grow in the face of challenge and uncertainty. The Challenging Outdoor Personal Experience (C.O.P.E.) course provides participants with opportunities to engage in exciting activities and to reflect and learn from those activities. This is a great course for Scouting groups, business/corporate teams, youth groups, church groups, and any other team! Initiative games: Used at the beginning of the course, this portion of the C.O.P.E. program helps participants to learn to work collaboratively, with communication and trust, to achieve their goals. Trust events: These activities foster trust among the participants and create a dynamic team, responsive to the needs of its individual members. Low-course elements: Challenging, mentally and physically-demanding modules that are closer to the ground require teams and individuals to demonstrate tenacity and ingenuity while working together. 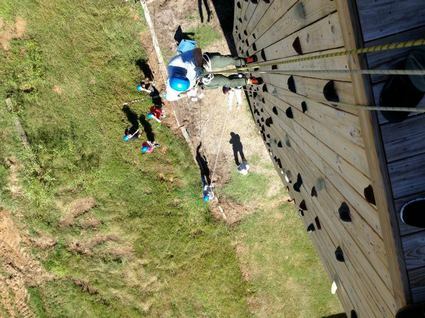 High-course elements: In these events focused on individual initiative, participants will complete the high-up elements of the course (like the Giant's Ladder), with the help of teammates belaying and giving encouragement. 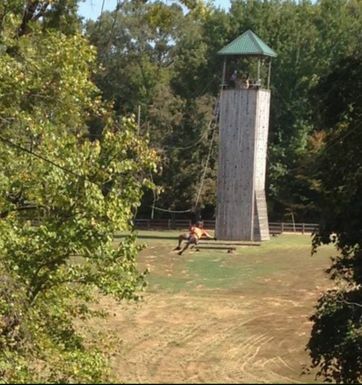 This portion of the course ends with the exhilarating 600 ft. zip-line! Program pricing and booking information can be found here. The C.O.P.E. Permission Form, required for all participants, can be found here.